The Le Souf box, a decorated chest containing a set of miniaturised Aboriginal weapons, was made by Albert and Caroline Le Souf a decade after the frontier period in the colonial state of Victoria, Australia. Invested with many key concerns of the nineteenth century's apprehension and representation of Australian Aboriginal peoples, this complex composite object of images, text and diminutive objects is animated by many cultural and scientific narratives of the era, including ethnography, typology, museology, miniaturisation and the fetishisation of indigenous weaponry. The Le Souf box is a transitional object, reflecting the shifting colonial ideologies of the 1860s and the gradual move from ethnology to the harder and more formalised racial sciences. Yet the box also reveals the personal and psychological desires of it makers, showing a genuine interest in Aboriginal people as well as an imperial nostalgia for an untainted past and an idealised pre-contact Aboriginal life. 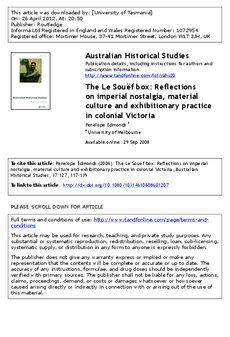 This paper seeks to bring an explorative postcolonial attention to the study of the Le Souf box, and considers the potential of reading European nineteenth-century objects of material culture that represent Aboriginal people as sources, and queries their historical reliability. The paper reflects on the implicit relationships between nineteenth-century European exhibitionary practices, memory work and Australian history, with material representations of Australian Aboriginal culture in a settler-colonial period that was marked by violent dispossession of Aboriginal people.